Zeitgeist. Photo courtesy the artists. Zeitgeist, Jin Hi Kim, and Douglas Ewart will join forces to present Night Mirrors, a haunting and evocative work that embraces the urban night environment. The sonic landscape of Night Mirrors features percussion instruments from around the world, melodious woodwinds, and komungo, a Korean fourth century fretted board zither. This varied musical textures plays within an improvisational framework that allows the musicians to respond to the environment as well as to each other. Jin Hi Kim is an internationally acclaimed komungo virtuoso and a Guggenheim Fellow in Music Composition. Ms. Kim has introduced the komungo for the first time into Western contemporary music through her wide array of compositions for chamber ensemble, cross-cultural ensemble, multi-media, and avant-garde jazz improvisations. Kim was awarded 2013 McKnight Visiting Composer with the American Composers Forum. 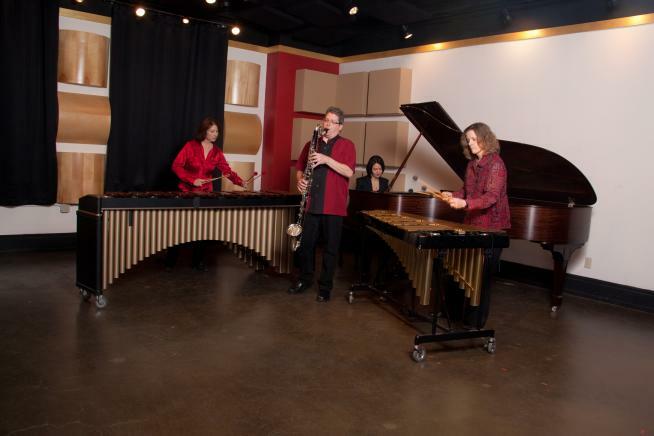 Lauded for providing “a once-in-a-lifetime experience for adventurous concertgoers,” Zeitgeist is a new music chamber ensemble comprised of two percussion, piano and woodwinds. Always eager to explore new artistic frontiers, Zeitgeist collaborates with poets, choreographers, directors, visual artists and sound artists to create imaginative new work that challenges the boundaries of traditional chamber music. The members of Zeitgeist are: Heather Barringer & Patti Cudd, percussion; Pat O’Keefe, woodwinds; Julie Sweet, piano.